• Share two (2) “teaser” sentences from somewhere on that page. Put them on your own blog, if you have one, and link to it in a comment to today's entry on the Books And A Beat page. If you don't have a blog, share your teaser in the comment. 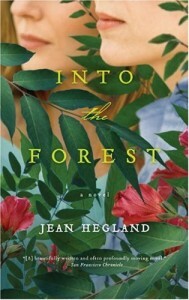 I just finished Into the Forest, by Jean Hegland. about teenage sisters living alone in their home in the forest during a time of turmoil. Fossil fuels have run out; the electricity has been off everywhere for months; and sickness, anarchy, and starvation rage across the country. But dancer Eva and scholar Nell, isolated in their forest, miles from the nearest neighbor, try to carry on with life as well as they can after the deaths of their parents. This teaser is from page 201, as Nell imagines their future (and a future child) in a new world. Eva would teach her to dance, I thought, and I would teach her to read and write, and as I clutched the oak and planned my niece's future, it seemed I could feel generations of women receding behind us and stretching out ahead. I felt a connection with both my foremothers and with the future, and I knew — despite all odds — the bone-deep satisfaction of continuance.